Honda will launch the all-new Civic in the Indian market in February. The all-new sedan will take on the likes of Hyundai Elantra in the Indian market but it will be much more driver-focused than any of the cars in the segment. Here are moose test of the Honda Civic sedan and hatchback to prove how stable they are and how much fun they will be to drive on the roads. Moose test is re-enacting of a scenario when a moose or any other animal suddenly appears on the road and the vehicle has to be turned quickly on the road to avoid the collision. The test is done with the help of traffic cones in controlled situations to check the stability of the vehicle. The driver inside the car directs the vehicle to a direction and then tries to bring it back on the line. The sudden change of direction reveals a lot about the stability of the vehicle, especially at high speeds. If the vehicle has a lot of body roll and is not a good handling vehicle, it can swerve, rolls and can even flip. However, the test of both the vehicles show that the Honda Civic is quite stable and maintains its line even under high-speed sudden turns. The Honda Civic enters the challenge at 79 km/h, which is a high speed. The vehicle skids a but stays in control. In the second run, the vehicle enters at 81 km/h. It stays where the driver wants it but the tail can be seen out of control due to the spinning wheels. Overall, the Civic did very well to pass the test. When the speed increased to 84km/h, the Honda Civic can be seen experiencing a lot of wheelspins but it stays on the course all through. The Civic also goes through slalom test where the direction of the vehicle has change while maintaining a high speed. 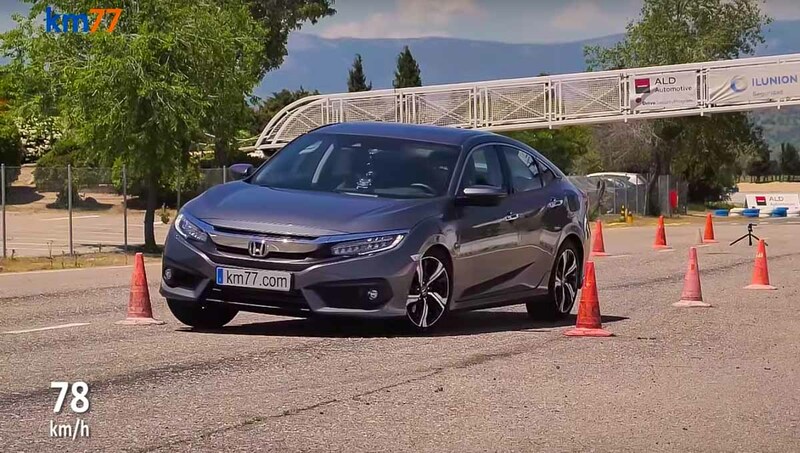 This is designed to throw the vehicle out of the track but the Honda Civic can be seen doing quite well in this test too.